Photo frames home wall collage housewarming gift will always be cherished as these pictures help to preserve and relive fond memories. Having these family collage frames wall hangings on the wall in the family room really does give you a feel of home sweet home, bringing with it a sense of belonging, a sense of a cozy home. Hanging up family pictures as wall decor is a beautiful way to give your new home the homely feel, warm and cozy. The metal wall collage art with photo frames is also a great way to remind you of family members who do not stay together with you, besides bringing back all those happy cherished memories. 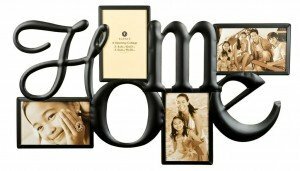 Fitting 4″ by 6″ photos, this metal wall collage is fitted with the word ‘Home’ in a most artistic way. This wall collage decor doesn’t come with nails, hooks or screws for hanging, you’ll have to buy your own. The 2 hanger holes at the back of the collage are quite small so make sure you get the correct size nails or screws to hang up the wall collage. The whole wall collage measures about 12″ x 21″. 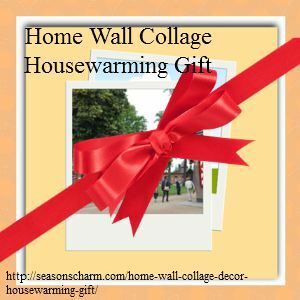 This Burnes of Boston home wall collage decor housewarming gift looks lovely and sentimental hanging on the wall of the family room.